This Persistence Market Research report examines the trends governing the lamination adhesives for flexible packaging market for the period 2016–2024. The core objective of the report is to offer an in-depth view of the key factors impacting the global lamination adhesives for flexible packaging market along with analyzing the future scope and market opportunities. Lamination adhesives are one of the main types of adhesives primarily used in the packaging of food products. Lamination adhesives drive demand from various application sectors owing to their wide usage in flexible packaging products. The report has been divided into three parts for better understanding and assessment of the global market scenario – market analysis by product type, end use, and regions. The report analyzes the global lamination adhesives for flexible packaging market in terms of market value and market volume. The report begins with an overview of lamination adhesives for flexible packaging and their usage in various applications across the globe. In the same section, the report covers the lamination adhesives for flexible packaging market performance in terms of revenue. This section includes a detailed analysis of the key trends, drivers, and restraints influencing the market from a demand and supply perspective. The next few sections of the report analyze the market based on product type, end user segments, and regions; and present the forecast in terms of value and volume for the next eight years. The final section of the report includes the market landscape for the lamination adhesives for flexible packaging market to provide a dashboard view based on different categories of market players along with their product portfolio and key differentiators. To arrive at the market size, the report considers the weighted average price of lamination adhesives for flexible packaging per ton across geographies. The forecast presented here assesses the total revenue of lamination adhesives for flexible packaging. The starting point is sizing the current market, which lays the foundation for the forecast of how the market is anticipated to take shape in the near future. Given the characteristics of the market, in-depth analysis based on supply side, demand side, and lamination adhesive consumption rate is taken into account. However, quantifying the market across the above-mentioned segments and regions is more a matter of quantifying expectations and identifying opportunities rather than rationalizing them after the forecast has been completed. The report takes into consideration Y-o-Y growth to understand the predictability of the market and to identify the right opportunities across the lamination adhesives for flexible packaging market. The report further analyzes the various sub segments in terms of market share to understand individual segments’ relative contribution to growth. This detailed level of information is important for the identification of many key trends in the global lamination adhesives for flexible packaging market. Another key feature of this report is the analysis of the lamination adhesives for flexible packaging market by revenue forecast in terms of absolute dollar. Absolute dollar opportunity is critical in assessing the level of opportunity that a provider can look to achieve, as well as to identify potential resources from a sales perspective. Persistence Market Research has also developed a market Attractiveness Index to help identify real market opportunities. 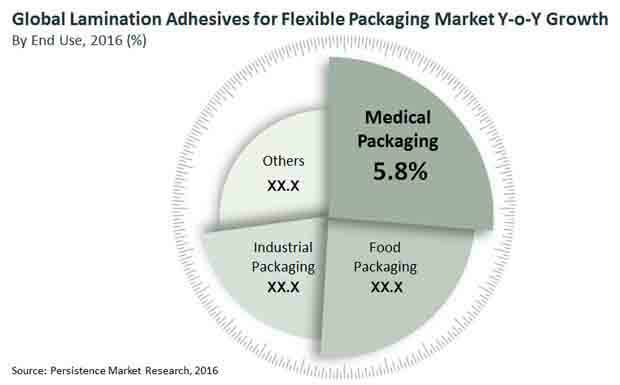 The report profiles key market players in the lamination adhesives for flexible packaging market. Leading companies profiled include H.B. Fuller, Henkel AG & Co. KGaA, The Dow Chemical Company, 3M, Flint Group, Arkema Group, Ashland Inc., Coim Group, Morchem, DIC Corporation, and Chemline India Ltd. The market share of lamination adhesives for flexible packaging is estimated to be 4% of the global adhesives market in 2016, and is projected to increase at a CAGR of 6.4% throughout the forecast period (2016–2024). The market value of lamination adhesives for flexible packaging in 2016 is estimated at US$ 1.3 Bn and this is likely to increase to US$ 2.2 Bn by 2024. Lamination adhesives for flexible packaging find wide usage in the packaging of food products. These adhesives are also sought after in the healthcare and industrial sectors, owing to high performance and anti-contaminant factors. The flexible packaging industry has witnessed immense growth in the last decade and is anticipated to grow at a substantial rate in the near future. This in turn is expected to drive the overall demand for lamination adhesives for flexible packaging. Other key factors such as lesser cure time, lesser emissions, lower wastage, and high bond strength have contributed to the growth of the lamination adhesives for flexible packaging market worldwide. Further, mounting demand for packaged foods in healthcare and personal care products have augmented market growth. However, government initiatives and growing consumer awareness towards the usage of eco-friendly adhesives have put a limitation on the growth of the lamination adhesives for flexible packaging market. Market consolidation has been observed as a key trend, with top market players going the mergers and acquisitions route to enhance their product portfolio and increase global footprint. Also, solvent less lamination adhesives are fast replacing solvent based adhesives owing to their eco-friendly nature. The global lamination adhesives for flexible packaging market is segmented on the basis of product type, end use, and region. On the basis of product type, the market has been segmented into water based, solvent based, solvent less, and heat/cold seal. On the basis of end use, the market has been segmented into food packaging, medical packaging, industrial packaging, and other end use. In the end use segment, while food packaging remains the key segment, lamination adhesives are likely to witness greater adoptability in the medical packaging industry during the forecast period. The solvent based lamination adhesives segment currently dominates the overall lamination adhesives for flexible packaging market in terms of volume and value. This segment has been estimated to account for 42.8% of the overall lamination adhesives for flexible packaging market revenue by the end of 2016. The solvent less segment is estimated to witness fastest Y-o-Y growth during the forecast period from 6.0% in 2014 to 8.2% in 2024. The adoption of eco-friendly adhesives for flexible packaging is expected to increase the global sales of water based adhesives 1.7X during the forecast period. The heat/cold seal product type segment is expected to increase 1.7X in terms of value over the forecast period. The medical packaging segment is estimated to expand at a significant CAGR of 6.9% over the forecast period. Food packaging is the key segment driving demand for lamination adhesives. Over 60% of the overall market demand is generated by the food packaging segment. On the basis of region, the lamination adhesives for flexible packaging market is segmented into North America, Latin America, Europe, Asia Pacific, and Middle East & Africa. 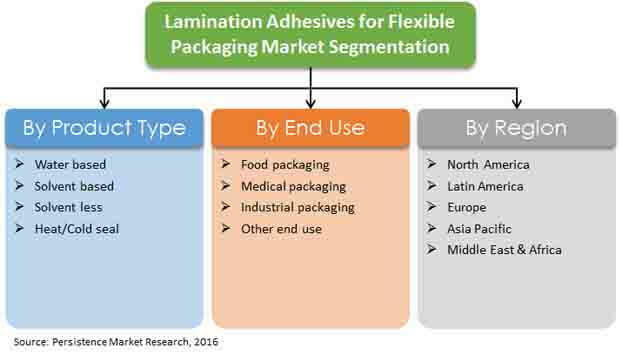 Asia Pacific is expected to be the dominant region in the global lamination adhesives for flexible packaging market. China and India alone are expected to account for over 40% of the market share. North America – though a developed market with multiple market players – is expected to gain momentum in the later phase of the forecast period with future investments in manufacturing sectors and re-engineering processes. The mature market in Europe is anticipated to witness uneven growth throughout the forecast period.